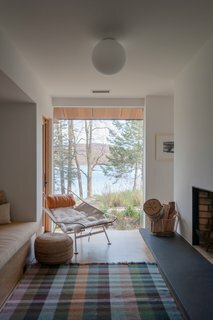 Less than two hours outside New York City, Candlewood Lake House blends midcentury modern charm and Nordic influences. When Catherine and her husband first saw their future home in the tiny Connecticut town of Sherman, an hour and a half’s drive from New York City, they were instantly charmed. Not only did the property offer a beautiful, lakefront location with privacy and close proximity to the city, but it also came with a midcentury modern home that had been virtually untouched since it was built in the 1950s. 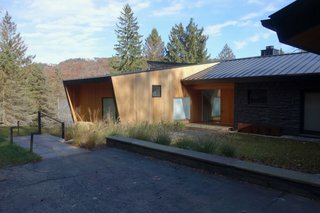 The existing stone walls of Candlewood Lake House were painted a deep black and matched with a new standing-seam roof. 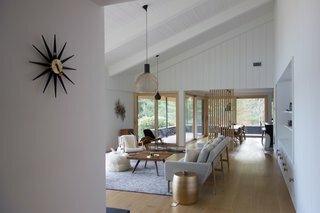 A lover of midcentury modern design, Catherine saw potential in the home right away—the couple loved the open-plan flexibility and the way the floor-to-ceiling windows pulled lake views indoors—and sought a sensitive renovation that would bring the outdated ranch to modern standards. 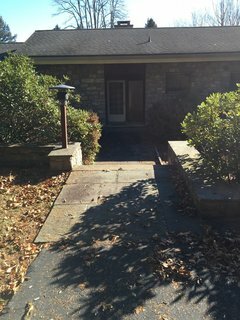 Before: The original home's asphalt shingle roof was damaged and needed to be replaced. Before: A closer look at the original entry. 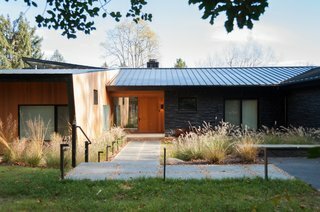 "At the exterior the entry is framed by the red cedar wall of the new addition, and the cedar-lined alcove, pushing into stone masonry wall, creates a generous covered space at the entrance," the architects add. 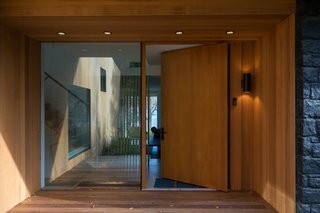 A massive, custom cedar door was installed at the main entry along with a glazed sidelight. 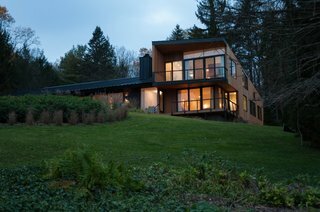 To that end, the couple tapped New Haven–based Gray Organschi Architecture, having spotted and admired the firm’s work in a Dwell Magazine feature. "We loved their attention to detail and contemporary aesthetics," Catherine says. "We wanted someone who could help us renovate and keep the original spirit of the house while bringing in a contemporary feel." The intent was to thoughtfully renovate the house into a family-friendly weekend home and a future retirement residence. 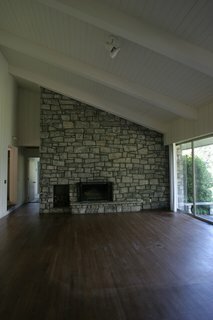 Before: The double-sided fireplace in the original living room was "visually noisy" and detracted from outdoor views. Before: The floors in the living area sagged and needed to be replaced. 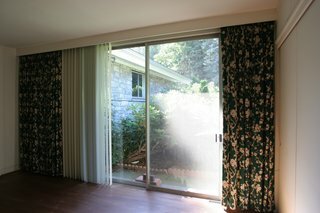 All windows and sliding glass windows were upgraded in the renovation. The minimalist fireplace was painted over and reduced in size, then articulated with cantilevered cleft slate hearths on either side. Seating is from the Design Within Reach Raleigh collection. Behind the double-sided fireplace is an intimate reading room alcove with a stellar view of Candlewood Lake. The chair is a vintage Flag Halyard chair. 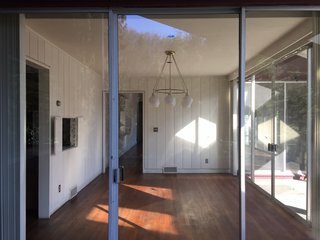 For a greater sense of flow, the wall that once divided the living room from the dining area was removed and replaced with oak slats. 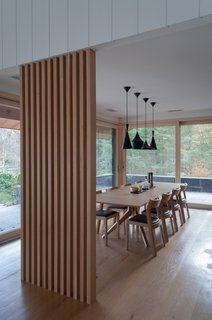 The tongue-and-groove wood on the vaulted ceiling and walls were repainted, while the floors were replaced with wide plank oak harvested and milled locally. High on the couple’s list of priorities was creating larger living areas for entertaining, additional bedrooms for housing friends and family, and a strengthened indoor/outdoor connection. 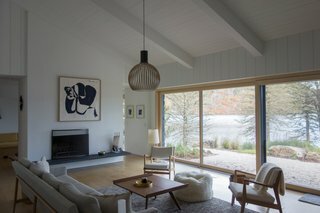 A gut renovation and layout reorganization achieved these goals, while original midcentury features, such as the vaulted ceiling in the living area and the double fireplace, were retained wherever possible. Before: The dining area was formerly cut off from the kitchen and living room. The dining room was opened up to the living room and kitchen for a greater feeling of openness. The dining table set is from the DWR cross collection and is complemented with Tom Dixon pendants to create an intimate feel. Before: The former kitchen felt constrained in size and cordoned off from the dining and living areas. 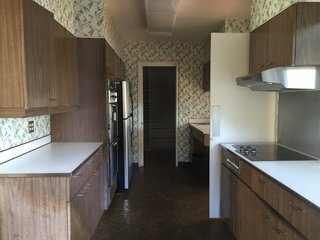 The kitchen was opened up to make way for more counter space and a large island. All appliances were updated with Bosch products. "The client was interested in a simple material and color palette of white oak uppers, matte black lowers with Corian countertops, and white gyp walls accentuated by patterned tiles," the architects say. 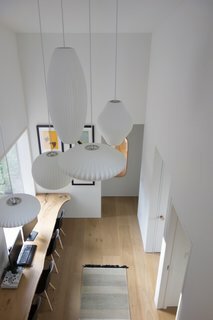 The pendant lights are by Secto design and the bar stools by Cherner. 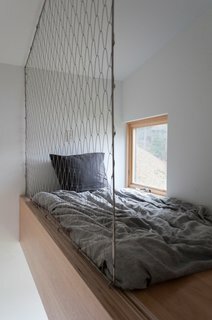 At the north end of the building, the architects added a long, two-story extension as the new bedroom wing: three bedrooms and a bunk room are on the ground floor, while the master suite is located on the floor above. 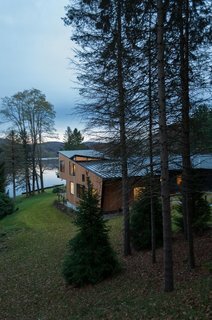 The design of the sloped addition, oriented for optimal views of Candlewood Lake, is a modern interpretation of the shed roof additions seen on gabled barns in Western Connecticut. 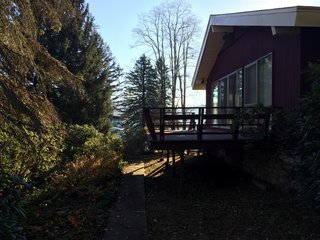 Before: Previously, the north side of the home housed a single bedroom, bath, and outdoor deck with lake access. 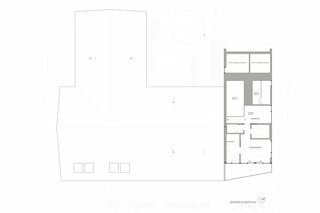 The angled design of the two-story north wing was inspired by the shed roof additions seen on gabled barns in Western Connecticut. 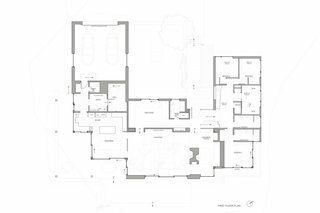 Located on the second floor of the new extension, the master suite takes advantage of long views down the length of Candlewood Lake. 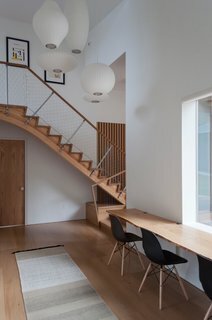 In keeping with the midcentury modern appeal of the house, Catherine furnished the interiors with period-appropriate finds, citing her brother-in-law’s Scandinavian vintage furniture store in Le Marais in Paris, Nordik Market, as a major inspiration. "Scandinavian design is a big source of inspiration, including the art piece above the fireplace which is from a Scandinavian artist," Catherine shares. 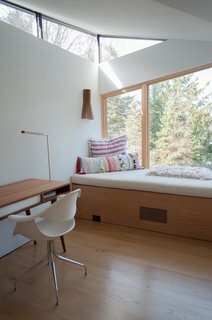 "The light fixtures—more than the furniture itself—were a major element I used to create a unique feel and make an aesthetic statement." 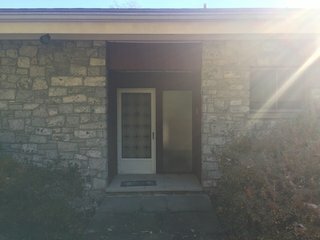 Before: The original house only had two bedrooms, including this master seen here. With the renovation and new extension, the updated home now includes four bedrooms and a bunk room for the kids. Before: The second bedroom in the original house was later converted into a family room. The largest guest bedroom is surrounded by walls of glass framing views of Candlewood Lake. The sloped roof in the new addition created space for high-lofted bunks in the bunk room. 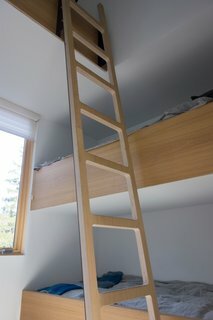 A ladder leads to the high-lofted bunk bed. A look inside the third bedroom, located on the west side of the north wing. 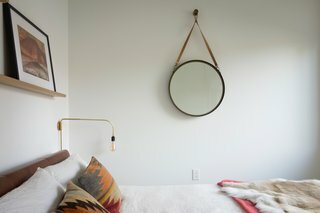 The hanging mirror is from CB2. All bedding is from Design Within Reach and CB2. 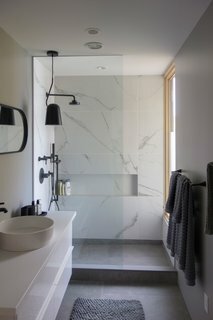 The guest bathroom boasts a minimalist look achieved with large, cement floor tiles and Statuario-style tiles on the walls. 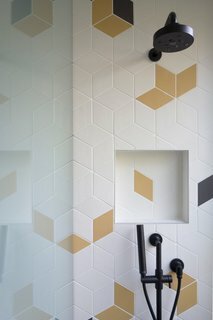 The kids' bathroom and entry bathroom sport colorful, geometric tile for a playful touch. Nelson bubble lamps hang above the kids' gaming station below. A second glimpse of the kids' gaming station in the new north wing. Eames side chairs pull up to the live-edge desk. 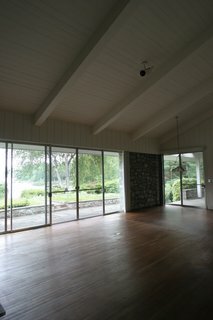 Before: Large structural beams and the visually busy stone walls detracted from the lake view. 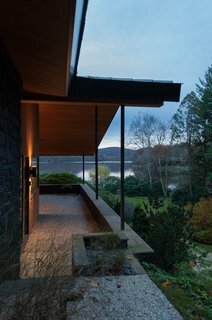 The updated south porch reinforces views of the lake with a more streamlined appearance. 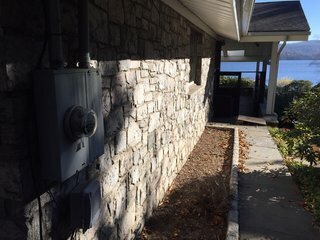 The existing siding was in poor condition and replaced with tongue-and-groove red cedar. 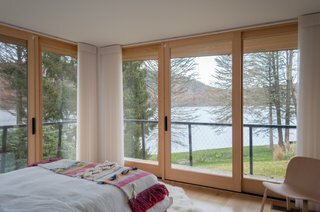 "The result is a series of vignettes—intimate passages and cozy spaces that open onto sweeping lake views," the architects note. 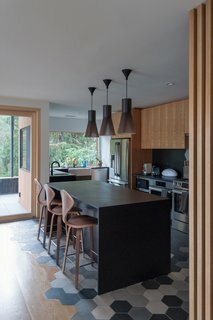 "Warm wood tones contrast against lush evergreens and existing stone walls newly painted a deep black." Catherine's favorite space in the house is this second-floor study by the master suite. "It's a great lounge area with a view of the lake," she says. "Everybody wants to go up there and read a book." 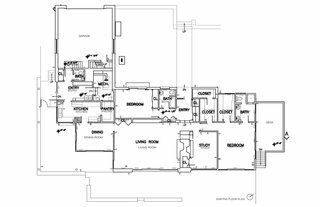 Floor plan of the original house. Civil Engineer: Arthur H. Howland & Associates, P.C.